Bad news for the committee. THREE FORMER SENIOR executives at Anglo Irish Bank will not have to appear before the banking inquiry after the Director of Public Prosecutions (DPP) intervened. 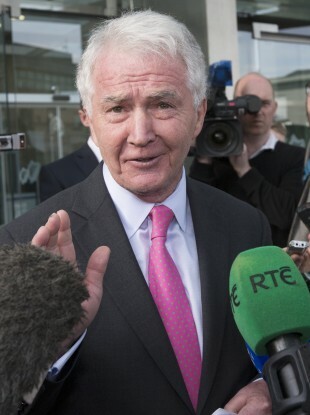 Former Anglo chair Seán FitzPatrick will now not have to appear, nor will Anglo executives Pat Whelan and John Bowe. The three were due to appear before the inquiry later this month. They were seen as key witnesses in the committee’s public hearings so it’s a setback for the inquiry. The DPP told the committee the men’s attendance could potentially prejudice pending criminal prosecutions. In a statement issued this evening, committee chair Ciarán Lynch said the committee is “disappointed” about the development. “While we accept that there are criminal proceedings ongoing, it is with regret that we are required to withdraw these directions. From the outset, the committee has been aware that our inquiry is separate from and not replacing the work of the courts. “The committee will continue its work to inquire into the reasons Ireland experienced a systemic banking crisis, including the political, economic, social, cultural, financial and behavioural factors and policies which impacted on or contributed to the crisis and the preventative reforms implemented in the wake of the crisis,” Lynch said. FitzPatrick and Whelan had been due to appear on 29 July, while Bowe was scheduled to appear on 24 July. The inquiry was also confirmed that former Anglo chair David Drumm has supplied a written statement that is being legally reviewed by the committee. The committee has also agreed to report another former Anglo executive, Tom Browne, to gardaí for not complying with its orders. Fintan Drury, a former non-executive director of Anglo and friend of Brian Cowen, will be questioned by the committee on 30 July. Read: What’s Bertie been up to? Email “Seán FitzPatrick WON'T have to answer questions about his time at Anglo”. Feedback on “Seán FitzPatrick WON'T have to answer questions about his time at Anglo”.